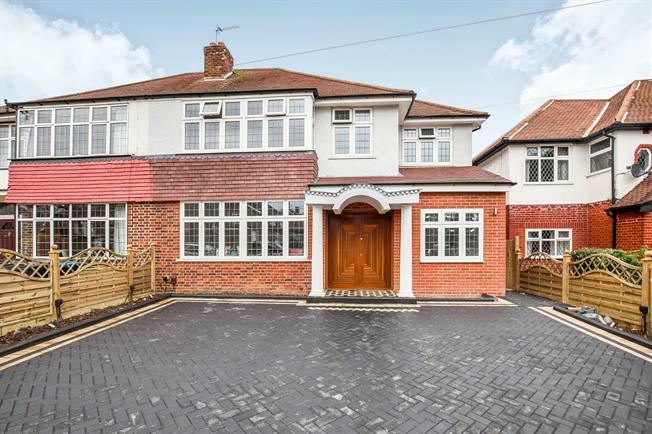 4 Bedroom Semi Detached House For Sale in Worcester Park for Offers in excess of £1,000,000. NO FORWARD CHAIN. A five bedroom family house, extending to over 2100 sq ft which has been recently refurbish to provide an elegant home for those who appreciate style and want a unique living space. The property offers a large kitchen/dining room and a huge 28ft x 19ft reception room with folding doors opening onto the rear garden. The ground floor is completed by a fifth bedroom/study an a shower room. The first floor has four good size bedrooms, one with an ensuite shower and a highly contemporary bathroom. The property has a number of unique stylistic features including hand crafted double doors at the entrance leading to a glass panelled staircase. Off street parking completes this one off family home. Church Road is well located for access to transport with Worcester Park and Malden Manor station providing a regular service to London Waterloo. Buses serve Kingston and the A3 provides access to London and the south of England by road. There are a number of well regarded schools in the area as well as local shops. Worcester Park has an excellent range of stores including a Waitrose, Sainsbury's Local and Costa Coffee.